Take a minute to look back at the different kinds of events that you’ve attended over your lifetime. Whether they were birthday parties, awards galas or industry conferences there are a few specific events that may stick out in your memory. More often than not, the ones that stick out to you most likely portrayed a unique aspect of the company or person’s identity. Think about a child’s birthday party; He or she would begin party planning by deciding a theme that represents their personality, such as “Disney Princesses.” From there, every aspect of the party encapsulates that theme: The invitations, food, decor, games and dress code. A young girl who dislikes Disney Princesses wouldn’t hold a princess themed party, because it wouldn't be an accurate depiction of her personal identity. Hosting events allows your company to better interact with your audience, and gives you the opportunity to increase awareness of your brand and mission. It also allows you the chance to portray your brand in a unique and fun way. Much like a child’s birthday party, your company event should be a positive representation of your organization’s identity, or brand. The goal is to immerse your core audience in your brand experience while they are distraction free. This doesn’t mean slapping your logo on every surface, and it certainly doesn’t mean you can stray from your brand’s core messaging. What it does mean is staying consistent, but putting a twist on what your brand represents. It’s best to think of your event design as a sub-brand of your company. The recognition of your brand should always remain at the forefront of everything that you do. Why does any of this matter? Because your brand matters. Consumers expect a consistent brand experience whether contact is made in person or online. One of the most effective ways to ensure brand consistency is through colour, as colour increases brand recognition by 80 per cent (*). 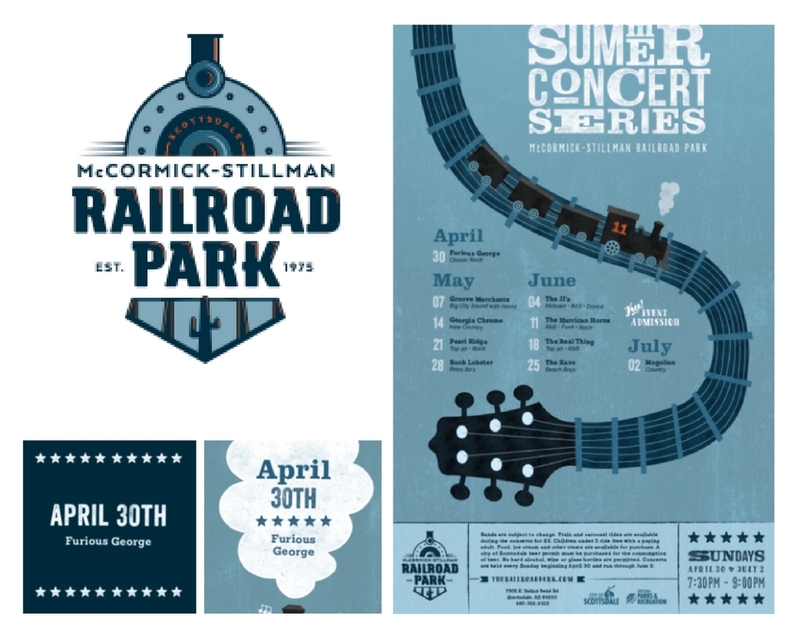 A spectacular example of colour consistency in event branding is done by the McCormick-Stillman Railroad Park in Scottsdale, Arizona, for their Summer Concert Series. Each year they create a new and fresh design that utilizes the brand colours and maintains the organization’s integrity. While there are various types of branding strategies, the two that you might be most familiar with are “In-Your-Face” branding and Subliminal branding. The former is a tactic that involves the inclusion of your logo, company name, or product name on every single piece of event collateral. The latter is a tactic that utilizes the subtle inclusion of brand messaging into the environment of the event. Through the subtle projection of your brand’s key messaging and values you can create an event experience, that through various elements, allows your audience to absorb your brand. At Boutique Collective we specialize in making a statement for your brand. From a full marketing promotion to à la carte services we enlist the best and brightest in the industry to ensure your goals are met. If you have a small-to-medium sized business, or would like us to work with you on your event branding and production, promotion execution and marketing plans get in touch with us today!